For today's project, I am featuring the Stitched Labels Framelits Dies from the Annual Catalog. This die set is a must-have for your craft room. You know, the kind that you reach for over and over again! Trust me, it's true, you will! The set includes 10 dies that will help you create beautifully stitched labels that you can add to all your projects! You can purchase the die set individually or with the Stitched All Around Bundle. The bundle includes the die set as well as the coordinating Stitched All Around Stamp Set, at a 10% savings! You can't go wrong with that! 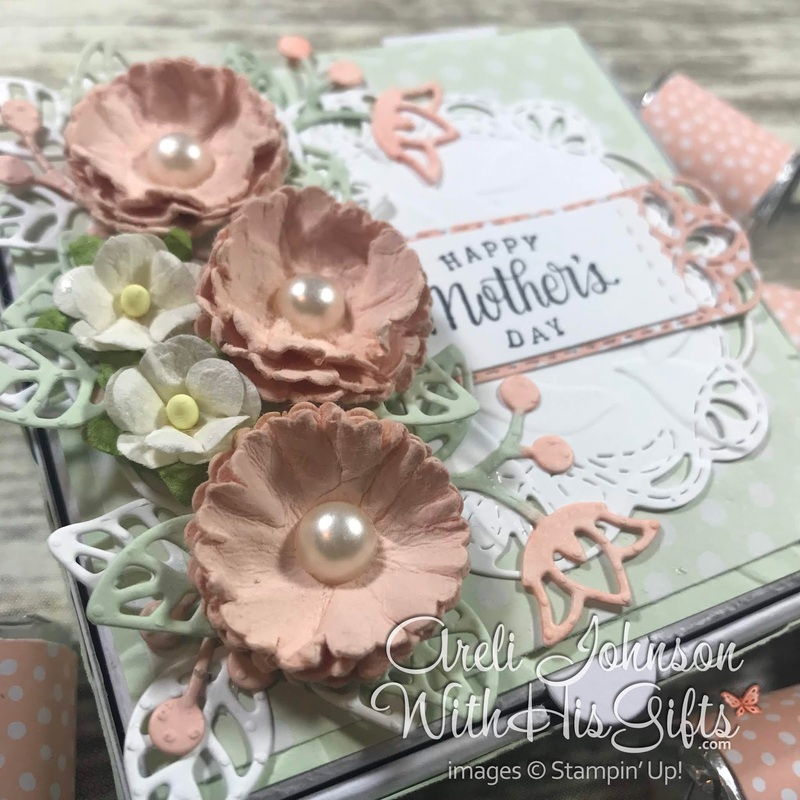 Along with the Stitched Labels, I used the Flourish Thinlits Dies (another must-have for your craft room), the Tea Together Stamp Set (for the Happy Mother's Day sentiment). This project doesn't have to be only for Mother's day. Simply switch out the sentiment and make it appropriate for your occasion! And my mini pizza box is filled with yummy Hershey Nuggets but you can fill yours with whatever your heart desires! Don't forget! The Mini Pizza Boxes are a Level 1 Sale-A-Bration item through March 31, 2019 which means you can earn them for FREE with a qualifying order during Sale-A-Bration! Now, gather your supplies, join me in my craft room, and be inspired to transform paper and mini pizza boxes into a little work of art. you always do such great work!!! I am always so happy when i see your name in my email box. You are so talented, i only wish you lived closer or i closer to you!!!! Thank you so much, Diana! I wish you lived closer, too! It's always a joy to have more crafty people in my life!